EXPANDING A STARTUP into foreign markets inevitably involves hurdles for any founder, but for Parsa Ghaffari those issues are multiplied. His attempts to grow his Dublin-based business, Aylien – which is developing software that make sense of large amounts text – in the US market have been made more difficult due to one problem: his passport. As an Iranian citizen, Ghaffari was restricted from entering the US due to the travel ban put in place earlier this year by President Donald Trump. The business was already active in the US market when the travel ban came into effect, and it hasn’t completely stopped Aylien’s expansion across the Atlantic. “The travel ban on paper is a horrible thing for us. It’s quite an important market for us because a large portion of our customer base are already in the US,” says Ghaffari. “Thankfully we are a diverse team, with 18 employees from eight different countries, and luckily they can travel much more freely. “Our head of sales just spent the week in New York, and last year I travelled to the US a few times myself, but the travel ban means I haven’t been able to this year. It’s now nearly five years since Ghaffari moved to Ireland to launch his startup, which means he is almost eligible for Irish citizenship – something he says he always envisaged applying for after his initial relocation to the country. 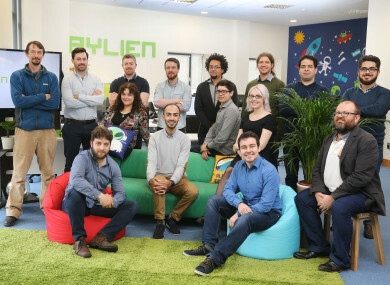 Aylien has been backed so far by Irish venture capital firm Atlantic Bridge and Irish-American investor Sean O’Sullivan’s VC wing SOSV, previously known as SOS Ventures. It was the link-up with O’Sullivan that initially brought the Iranian entrepreneur here. Ghaffari says between 2011 and 2012, he was desperately looking for somewhere with very little red tape to launch his startup. At the time, he was just after finishing an accelerator programme funded by SOSV in China, but he felt the Asian superpower wasn’t the best place for a fledgling firm. Meanwhile, his home country of Iran was a poor option due to the trade restrictions in place between it and the US. It was a suggestion from O’Sullivan that pointed Ghaffari towards Ireland’s ‘Startup Entrepreneur Programme’ – a state scheme that offers visas to foreign startup founders to attract them to set up in the Republic. “If you asked me of the countries I was most likely going to relocate to, I wouldn’t have probably put Ireland on the list at that time. Since the startup was launched, the business has moved from its first home in Cork to its current base on Pearse Street in the capital. It has also shifted from providing a product for online publishing companies to a much broader concept. The original idea, according to Ghaffari, was to create a tool that would collate third-party information based on information in an article or blog. Now the business is focused on a wider problem, making sense of large amounts of data for clients. It already has some big-name clients including Sony, Microsoft and Deloitte paying to use its text analysis product and recently raised a significant amount of funding from its investors to go after more clients. O’Sullivan’s VC firm pumped more cash into the business as part of the latest, €2 million funding round, topping up the €600,000 the startup received in early 2016. Ghaffari says the funding will be used to grow its Dublin team, which is currently made up of 18 staff. In total, 70 jobs will be created as a result of the investment, both in the Republic and new international bases such as the US. Email “Meet the Dublin startup trying to win new business... and overcome Trump's travel ban”. Feedback on “Meet the Dublin startup trying to win new business... and overcome Trump's travel ban”.